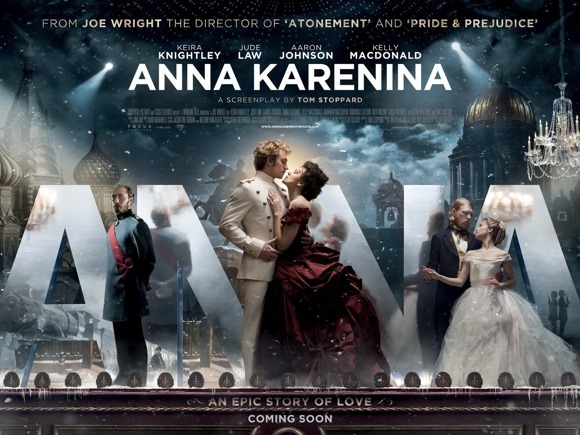 Leo Tolstoy's novel, Anna Karenina, is task enough just to read, let alone adapt for film. A tale set in Imperial Russia following several couples and their relationships as they change over time, Tolstoy traverses the many different types of love and their effects on the soul. And I'm happy to say that Joe Wright's adaptation does the same. When trying to fit 800 pages into a little over two hours, cuts must be made. And Wright does so, but less than one would expect, whirling the viewer at a breakneck pace through the exposition, slowing only as the story really picks up so we have more time with these characters when it matters. Wright often gets away with the speed of these scenes by his skillful use of the stage. 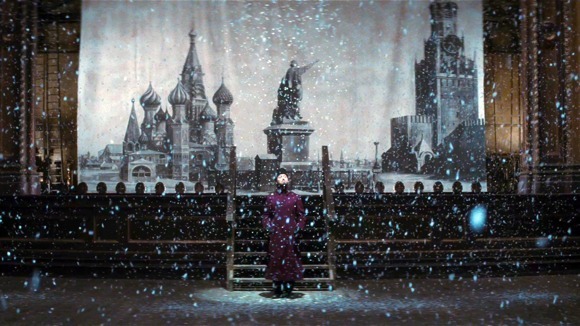 Yes, that's right, this film takes place in many scenes on the stage of a theater. We transition from one place to another through revolving set pieces coming and going, allowing a character to travel many miles in the space of a few moments as the stage hands transform an office into another man's home in the span of a few seconds. It is breathtaking to see the choreography necessary to accomplish these shots. Some scenes are shot on location, but many are set in the theater, creating scenes that take on new life by being set in a medium that we don't normally interact with, especially in films. Thankfully though, Wright isn't just using this artistic choice to look cool or accomplish quick transitions; it also functions to reveal one of Tolstoy's key themes. Throughout the novel, and film, there is a continual contrast between the city and the country, showcasing how the people who live in each differ from one another. A key part of this is showing how in the city (St. Petersburg and Moscow in this case) people must live up to expectations, they have to put on a good face to keep up appearances, even if they feel quite differently. An obvious metaphor is that of an actor on a stage, thus adding yet another layer to this magnificent choice. It makes me happy to see this film nominated for an Academy Award for Cinematography because this is one of the most beautifully shot films of the year. And the acting is amazing: Jude Law is an amazing Karenin, and if you don't like Keira Knightley it's ok because you're not supposed to like Anna. If you've read the book, you really need to see this movie, and if you haven't, you should see it anyway to see a great adaptation of an amazing story.